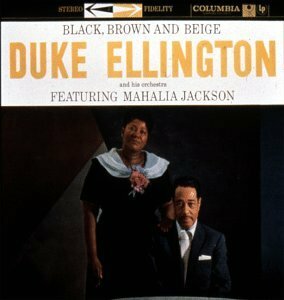 Duke Ellington originally wrote the 50-minute "Black, Brown and Beige" in 1943 for a Carnegie Hall concert, where critics dismissed it as overreaching for a jazz composer. Over the next 15 years, he periodically resurrected it for performances of excerpts or, as in the case of his 1958 Columbia album, transmuting it into what was essentially a new work. Long out of print on vinyl and only available as an import on CD until 1999, the original Columbia Black, Brown and Beige album was one of the most extraordinary products of Ellington's second stay with the label, growing out of his 1956 Newport triumph, and it was received somewhat more readily than the original 1943 "Black, Brown and Beige." The main problem for those who knew the piece and its history lay in the absence of Johnny Hodges, who was hardly ever with the Ellington band during 1958, and on whose talents "Come Sunday," the centerpiece of the original work and even more the core of the revamped Black, Brown and Beige, was built. Instead, Mahalia Jackson sings a version of "Come Sunday" that is, if anything, equally affecting, backed by the orchestra led by Ray Nance's violin. The result on the original album was a piece that started off in big band-style blues and led to one of Ellington's most moving, wrenching pieces of work, and music that, had it been better known, might also have done more to raise people's consciousness about civil rights than a hundred folk songs of the period. An expanded 1999 reissue has ten bonus tracks, including eight flawed but fascinating alternate takes of the complete work. There's not a note of music that isn't worth hearing anywhere on the CD, and the album is a welcome restoration to the catalog.